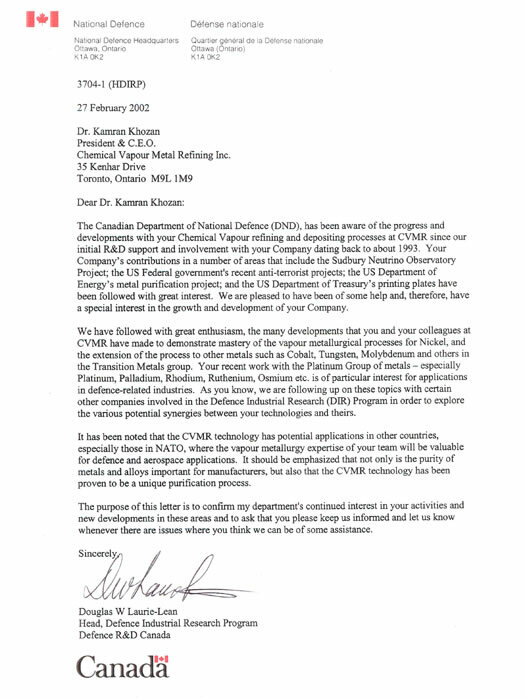 Canadian Department of National Defence reference letter, supporting the technology and processes of CVMR® for work in the refining and purification of base metals (e.g. nickel, tungsten, molybdenum etc.) and platinum group metals. 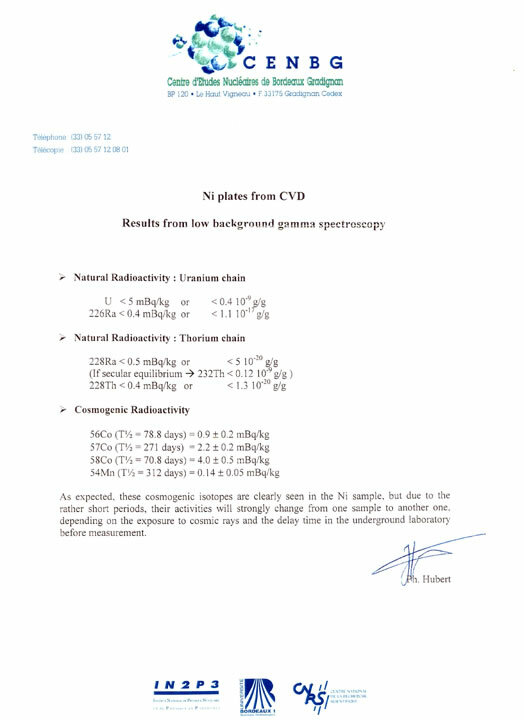 The findings from the Centre d'Etudes Nucléaires de Bordeaux Gradignan physical testing laboratory in France, showing the extremely low level of contaminants in metal produced by CVMR®'s vapour metallurgy processes. 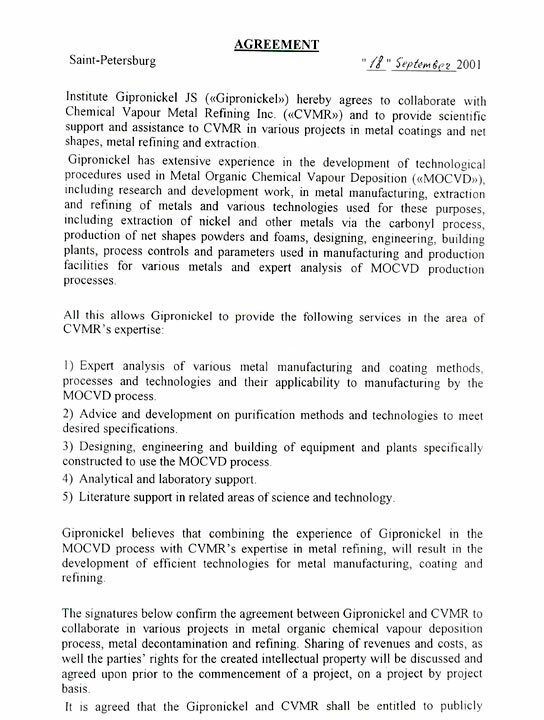 Letter of agreement for cooperation between CVMR® and Gipronickel of Russia (the Research division of Norilsk Nickel) for the exchange of scientific and technical information, relating to vapour metallurgy and carbonyl technology. 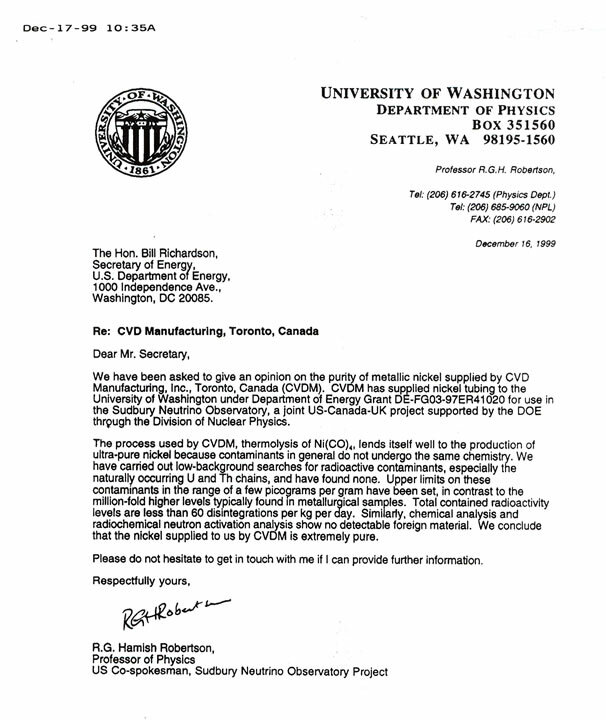 Letter from University of Washington, USA identifying the extreme purity of nickel parts made for the Sudbury Neutrino Observatory, a multi-national scientific research project with the US Department of Energy's Division of Nuclear Physics. 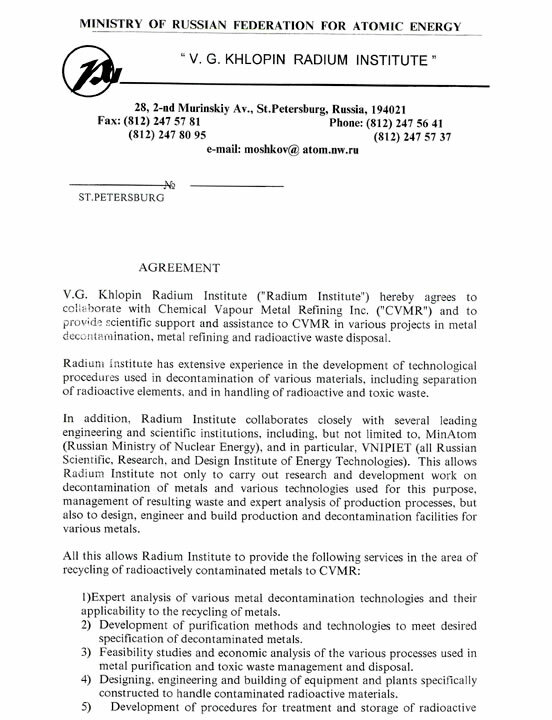 Letter of agreement for cooperation between CVMR® and the Radium Institute of Russia at St. Petersburg, on matters of decontamination of metals related to nuclear energy processes. O'Meara, M F.: "Recycling Metals Using the Metal Organic Chemical Vapour Deposition Process" at the Fourth International Symposium on Recycling of Metals and Engineered Materials. (TMS fall 2000 Extraction and Process Metallurgy Meeting, Pittsburgh). 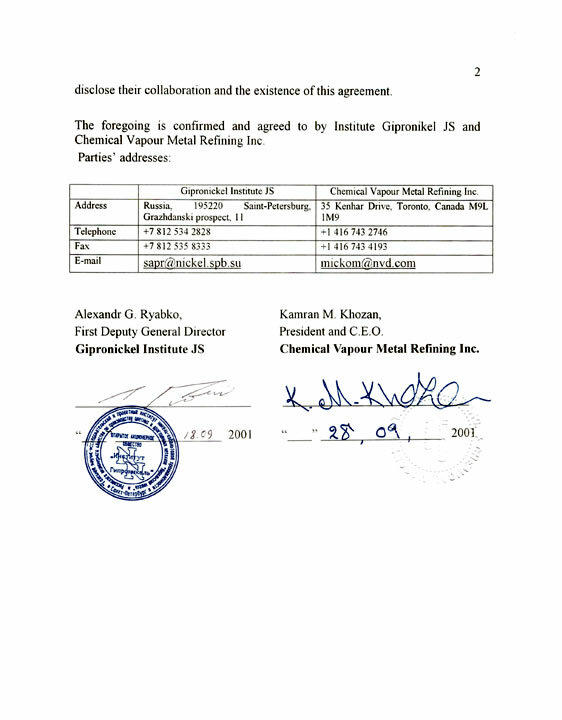 "Chemical Vapour Metal Refining (CVMR®) of Platinum Group of Metals (PGM)" Sergey N. Kovtun, Mick F. O'Meara, Nanthakumar Victor given at the Australian Institute of Mining and Metallurgy Conference, 2002, Sydney NSW. Chemical Vapour Metal Refining (CVMR®) is a process of extraction and refining of metals from ore, ore concentrates or recycling materials. The CVMR® process was developed, in its basic form, at the beginning of the 20th century. At present, more than 20% of worldwide annual nickel production is refined using carbonyl technology, a variety of CVMR® process. Carbonyl technology (the Mond process) is a vapour metallurgical refining method based on the ability of nickel, iron, cobalt, etc. to form volatile metal carbonyl compounds. Carbonyl process was suggested as the best method of refining metals on Moon and Mars. We propose to combine metal refining and production of metal parts in the same process. As part of CVMR®’s research for production of high value products (powders, foams and net shapes) from nickel, we have developed a self-contained unit capable to perform extraction of metals and manufacturing metal net shapes at the same time. What is missing, is a carrier to deliver an adaptation of such unit to the other heavenly bodies to begin mining and production of metal structures. In this presentation we review the feasibility of usage of self-contained units to space mining, including the chemistry and engineering challenges. The presentation emphasizes extraction of base metals such as Fe and Ni and production of iron or stainless steel structures in situ. 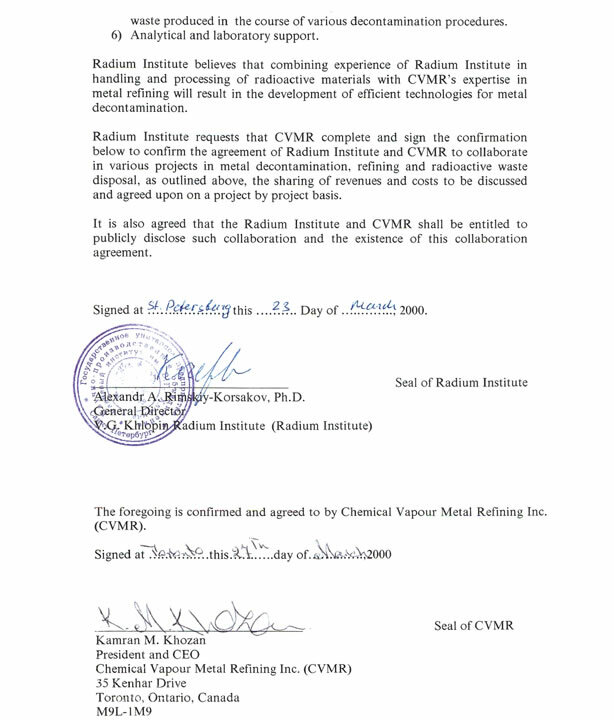 The paper also reviews an application of CVMR® technology to other metals. "Recycle of Zirconium from Used Nuclear Fuel Cladding:A Major Element of Waste Reduction - 11336 "
"Views on Practical Approaches to Recycling Used Fuel "